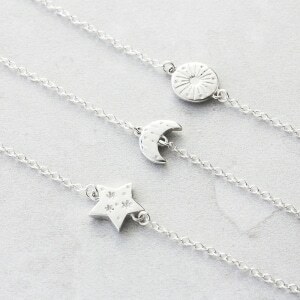 Our new sun moon and stars collection features sparkling celestial symbols with beautiful sentiments attached to them. We created this collection with these types of sentiments in mind, something I always say to my children is that I love them sun, moon and stars – and back again, which inspired me to design the Sun Moon and Stars Bracelet. We had wonderful feedback from our customers, plenty of whom have their own little sayings like “I love you to the moon and back” – so we decided to create a whole collection around beautiful celestial symbols. Celestial motifs appeal to us for a number of reasons – and we often associate the ones we love with these beautiful, heavenly bodies. Do you love someone to the moon and back? Do you have someone who is your shining star, or your little ray of sunshine? Check out our sun moon and stars collection below, and you’re sure to discover your own unique meaning. Wear the mixed metals look in style with this sun moon or stars bracelet! With a beautiful menagerie of colours and textures threaded together in a delicate sterling silver chain, you are bound to fall in love with it. The sun is in sparkling gold, the moon in warm rose gold, and the stars in glittering silver. 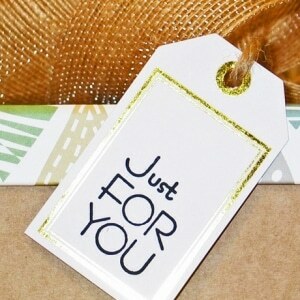 Plus, you can add a sentimental message to make it extra special. 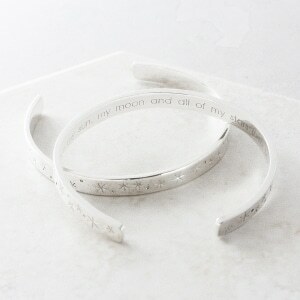 These beautiful bracelets, named ‘You are my Sunshine’, ‘Moon and Back’ and ‘All my Stars’ are adjustable at 17-19cm. Choose the celestial symbol that means the most to you – sun, moon or star. Each delicate silver bracelet is cast with deep cut lines that really catch the light, and features a tiny charm that has detail on both sides and hangs from a fine trace chain. The perfect for gift for a loved one. ‘I Love You More Than All the Stars In The Sky’. Whatever your chosen inscription, the lucky recipient is sure to treasure it forever. Reach out for the stars, and wear the sun and moon around your neck. This beautiful celestial necklace is dreamy, delicate and romantic – and it matches wonderfully with our sun moon or stars mixed metals bracelet. 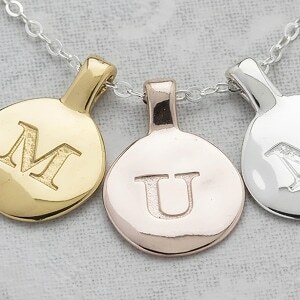 The use of mixed metals means this necklace is stylish and on-trend. Perfect for Christmas, Valentines – or any other special occasion when you’d love to lay all the stars at her feet. This bracelet has been inspired by words our jewellery designer says to her children: “You are my sun, my moon, and all of my stars.” This gorgeous personalised silver bracelet features three solid silver charms inspired by the heavenly bodies, with a little silver bar for engraving a name or date of your choice. It’s available in both child and adult sizes, so it’s a great option for you and for your little stars!